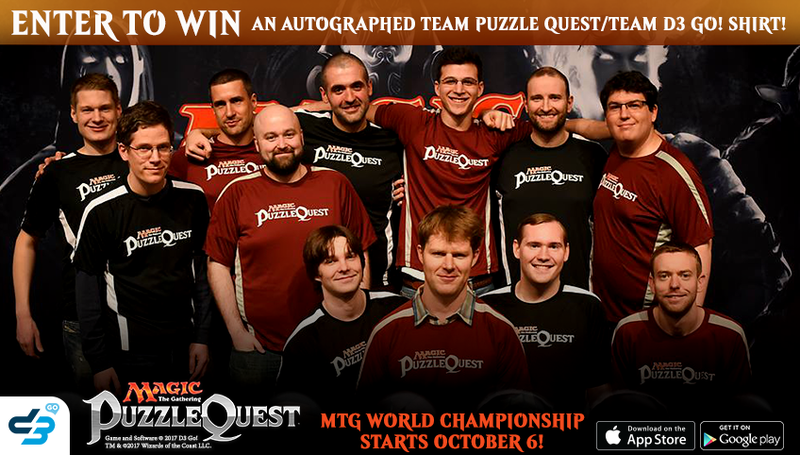 ENTER TO WIN AN AUTOGRAPHED SHIRT FROM TEAM PUZZLE QUEST! - D3 Go! ENTER TO WIN AN AUTOGRAPHED SHIRT FROM TEAM PUZZLE QUEST! Update: Sweepstakes is now closed, thank you to everyone that has entered. Everyone at D3 Go! are super excited about the Magic the Gathering 2017 World Championship Event taking place in Boston, MA between October 6 – 8. While Team Puzzle Quest and Team D3 Go! did not qualify for the Team Series Championship, three members of Team Puzzle Quest qualified to compete in the World Championship. The competitors from Team Puzzle Quest include Reid Duke, Owen Turtenwald, and William “Huey” Jensen. Watch their interview discussing their teammate strengths as they compete on the tour. We wish these three the best of luck at the World Championship Event! For more information about the upcoming Championships, please visit HERE to get all the details. As the season comes to a close, we have a pretty unique opportunity where you can enter the sweepstakes to win an autographed team shirt signed by both Team Puzzle Quest and Team D3 Go! Please head over HERE to enter. Please see official rules HERE for details. Good luck and thank you to everyone on Team Puzzle Quest and Team D3 Go! for a wonderful season!